With the popularity of Twilight and True Blood, Clayton and I decided that one of our costumes for Halloween this year was going to be 1920’s vampires. This was specifically inspired by an episode of True Blood which showed a flashback of one of the main characters in the 1920’s. 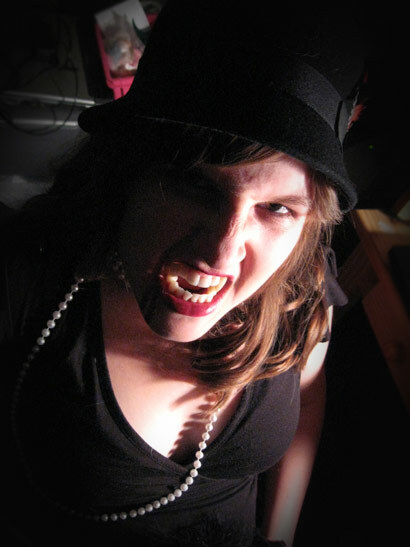 Vampires are a common costume now, but I thought that adding a time period would put our costume above the rest. It was a fairly easy costume for us to put together. Most of the accessories were found at thrift stores and regular clothing stores such as black heels, feather boa, and the hat. The lace gloves and fishnet stockings can be bought from Aradani Studios as well as the Scarecrow fangs that both of us used. The dress was easily made by using a black dress bought from Wal-mart and sewing red fringe to the bottom to create a flapper dress. To finish off the costume: I curled my hair. I also put on red shimmery makeup around my eyes to create an undead effect and also applied bright red lipstick for the time period. The last finishing touch was the fake blood which had to be reapplied throughout the night because it would crack off. One of my favorite things to do is to use a scarring liquid and purple/red make-ups to make bite marks (even though vampires heal themselves). All of these little things help to complete your costume! 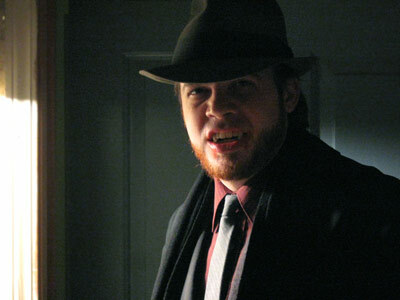 It is a fairly basic costume using a suit and a fedora to create a 1920’s look. He also used scarecrow teeth as well as fake blood which can be bought at Aradani Studios. Prosthetics such as our latex or silicone vampire forehead would work well if you are going for a “Buffy” style vampire. Make-up can be applied around the eyes to make them appear sunken in and more mysterious. Of course the final touch is fake blood! Purchase vampire products from the Aradani Costumes store!